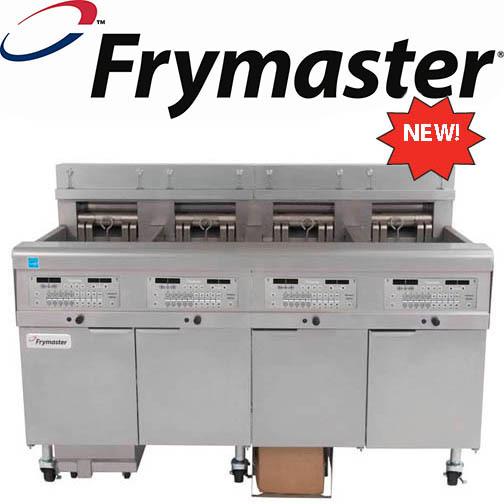 Here’s a look at the new technology being introduced by Frymaster at the 2014 National Restaurant Show. It’s called FilterQuick with Fingertip Filtration. Frymaster’s new system will let you say goodbye to the 17 steps to “built-in filtration” which require a cooling period before you can get down on your knees with rubber gloves, brushes, paper towels, filter paper and filter powder to complete the task at hand. Say goodbye too, to the 23 steps to “portable filtration” which involve much of the same, plus a filtering unit that is rolled into the work area, blocking off traffic while you proceed. FilterQuick can be operated with a single fingertip control. Once activated, it automatically agitates the oil to lift crumbs from the bottom of the frypot. It cools the oil, pumps it, filters it, polishes it, refills the frypot, and reheats the oil while topping it off. What is even more amazing is that it completes this entire operation in only 4 minutes! The FilterQuick makes frequent filtering easy. The result is cleaner oil and fresher tasting food. It also saves the operator money by maximizing the optimal oil life. Although preliminary field tests were not yet complete, it appears that when comparing FilterQuick™ to a system without filtering, oil life was extended by a factor of four. That means, for example, an operator can change the oil once every 12 days instead of once every 3 days. Think of the dollars saved on annual oil costs alone, not to mention the savings on labor. The FilterQuick with Fingertip Filtration has many other features and benefits including 20 fryer setup buttons for different products. It is fast, simple and safe for both new and experienced operators. The cook can never be “locked out” of cooking and can always override the filtering process if necessary. It has an energy saving feature that reduces the heat load while idling, and is available in electric or gas, with batteries of 2, 3, 4 or 5 frypots. It is certified NSF, CSA, UL, TUV / CE, Australia, and Korea.